Again - not too long ago. 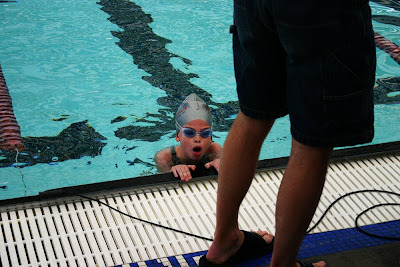 Hannah's 2nd or 3rd long course swim meet. It was a 50 freestyle. She couldn't breathe when she came into the finish. And so it all began!! Funny.. Look how big her cap is on her head!! I think she won this race!! Now she swims the 1000 freestyle and hops out of the pool and goes and hangs with her friends. No heavy breathing, no throwing up, not even hiding in the bathroom.. remember those days!! Love you Hannah!! You make me very proud of your determination to better yourself everyday. Amazing how far she's come in such a short amount of time. You rock, Hannah! super star... so serious... she wows me!